We’ve extended the deadline for this competition by two weeks. You asked for more competitions, so here’s another one! 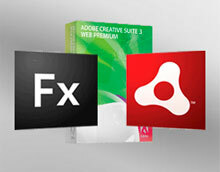 We’re giving away two copies of Adobe CS3 Web Premium (kindly donated by Adobe) to the authors of the best articles about Adobe Flex and AIR submitted over the next four weeks. That’s right — you could WIN a copy of the ultimate graphics package for web developers, Adobe Creative Suite 3 Web Premium, just by submitting an article about Flex or AIR. Worth USD $1,599, the package includes the latest versions of Photoshop, Illustrator, Fireworks, Flash, Dreamweaver and a host of other tools that form the industry benchmark for creating web graphics. Write an article for publication on sitepoint.com about Adobe Flex or AIR (Adobe Integrated Runtime). We’re mostly looking for tutorials (either standalone or multi-part series). The article(s) must be original and must not be already published online elsewhere. We’re interested everything from beginner articles to intermediate and advanced topics. Also note that we’re looking for quality content (first-time authors might want to run their article past a friend or colleague before submitting). Submit the article before Sunday May 4th May 18th, 2008. That gives you nearly four weeks! Be sure to include a headshot and author bio with your submission. The authors of the best Flex article and the best AIR article will each win a copy of Adobe CS3 Web Premium (either Mac or Windows — your choice). The winner will be decided by myself and SitePoint’s Technical Director, Kevin Yank. Submit your article to submit (at) sitepoint.com. It’s best to concentrate on one thing, rather than trying to demonstrate how to build a complex application from start to finish. Try to adhere to the recommended word limit (between 1,000 and 2,000 words). Be sure that the reader has some useful code to take away from the article. Include a downloadable code archive with your submission if necessary. Please make every effort to ensure that your code is bug-free and best practice. Our diligent technical editing team will be testing your code, but we won’t be correcting them. If your code has bugs, we’ll send it back to you to fix. For more tips, please read our Write For Us page and our author submission guidelines (PDF). Even though there will be only one winner for each of the topics, we may choose more than one article for publication. In fact, if they’re all good, we may publish the lot! So even if you don’t win, your article may still make the front page of SitePoint! That is all. Get writing and good luck!